“As a new Chair who stepped into the role on 1 April 2017 let me first acknowledge the part played by my predecessor Charlotte Dixon who has led Citizens Advice Epsom & Ewell so ably for the past three years. 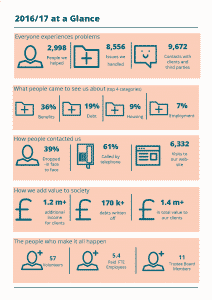 Once again, the big four areas of our work in 2016-17 were welfare benefits, money advice and debt, followed by housing and employment but the range of issues and problems extends into many other areas of people’s daily lives, such as consumer goods and services, financial services, tax and pensions, student loans, travel and transport, immigration, the utilities and winter fuel payments, relationships and family matters, food safety, boundary disputes, etc. In many cases people came to us with a complex web of related issues emanating from various diﬀerent policies, laws and agencies. Unsurprisingly the complexity of modern life is mirrored in the everyday problems that aﬀect people’s lives and all too often the solutions are that much harder to find. This is a key issue for us going forward. clients chose to access the service by phone, a trend that is expected to continue. Our report rightly stresses the importance of further widening access to the service in response to changing work and life patterns for the community we serve. These are challenges which we will need to get to grips with in the years ahead. We are grateful to Epsom & Ewell Borough Council who kindly provide our core funding and our office space in the Old Town Hall in Epsom. We greatly appreciate their continued support despite the increasing financial pressures faced by all local authorities. We also run two successful specialist advice projects; namely Money Advice and Debt, funded by Rosebery Housing Association and Epsom & Ewell Borough Council; and our Mental Health outreach service which is funded by the Surrey Downs CCG, East Surrey CCG, Big Lottery Fund and Lloyds Foundation for England & Wales. We are hugely grateful to all of our funders whose generosity enables us to continue to provide the advice that helps people resolve the problems they face in life, but we are always in search of additional sources of funding. We still need to raise around £15,000 a year in donations and other income (roughly £5 for each client we help) to maintain the current level of service. “In the past year, we saw people continue to come to us with a wide range of problems, but standing out in this was the continued impact of the tightening of welfare reform. Over 1 in 3 of the problems people brought to us were related to welfare benefits, and our gain for them of £1,065,233 in benefits income alone in the year provided much needed income for essentials. Almost 1 in 5 of the issues brought to us involved debt, often significant and emotionally draining for the people involved. Housing and employment issues followed closely and with these issues often arriving in a bundle, the skills of our advisors and assessors came to the fore as they unpicked to find and address the causes of the issues. Amongst this turbulence, we continued to work closely and innovatively with our partners, existing and new, looking for changes that widen our advice service to serve local people better in this changing world. As the population of the Borough grows and as Central Government appears committed to reducing the deficit through cuts to public spending, we expect to see demand for our services increase, but in new ways. The biggest of these is in the increasing demand for phone access, plus across wider hours, and so much of the latter half of the year was spent in preparing for the move to join the national Adviceline phone service in order to take advantage of the scale of the service on oﬀer. 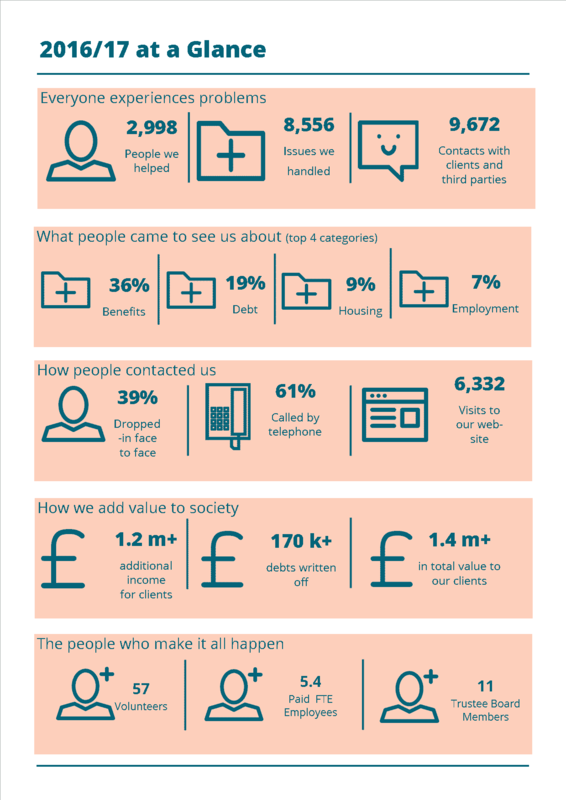 This year has also seen some welcome improvements to our operations, as the National Citizens Advice service continues to respond to the same changing social and economic landscape, albeit on a national scale. These include new membership agreements and governance for local ‘Bureau’ offices such as ourselves, new advice-support tools, adoption of common ‘cloud’ technology allowing greater flexibility in where we work, including faster broadband for us in Epsom, and most “publicly”, the continued rollout of the new branding.